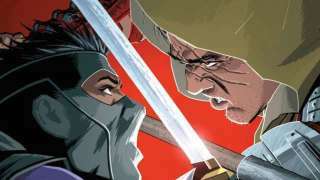 Valiant Entertainment has provided ComicBook.com with an exclusive first look at the solicitation text and cover for Ninja-K #11, due in stores on September 12. The issue begins a new storyline, titled "Fallout," and provides a new status quo as Ninjak deals with the fallout of his battle with the Coalition and squares off against The Eternal Warrior. ...I mean, yeah, you can see that in Ninjak vs. the Valiant Universe, but who doesn't love Eternal Warrior when written by somebody like Christos Gage?